Help Kud-Ei from the Bravil Mages Guild save her missing friend. Speak with Kud-Ei about her missing friend. Follow her to Henantier's House, and ask her about the amulet. Equip the amulet, and go to sleep. Enter Henantier's Dreamworld; after Henantier speaks to you, find his patience, perception, courage, and resolve. Pass all four tests, and you are returned to Henantier. You and Henantier are transported back to the real world. Henantier gives you six scrolls as a reward. Speak with Kud-Ei, an Argonian in Bravil's Mages Guild, to learn about her missing friend Henantier. It turns out he is not missing at all, but he has been experimenting with dangerous magic against the regulations of the Mages Guild. This could get him expelled, so Kud-Ei does not want to seek help through regular channels. Follow Kud-Ei from the Mages Guild to Henantier's house. Speak with Kud-Ei again to learn that Henantier created an amulet that would let him consciously explore his dreams. However, it seems he is now trapped within his Dreamworld. Kud-Ei cannot enter his Dreamworld, because Henantier would dismiss her presence as conjured memory from his own mind, so she needs a total stranger to help him escape. Speak with Kud-Ei again to receive the amulet; equip the amulet, and go to sleep. You then enter Henantier's Dreamworld; you will lose your entire inventory except for the amulet. Furthermore, the amulet does not allow the use of magic, although any spell immune to Silence, such as Powers, will still work. Upon entering the Dreamworld, you will be approached by Henantier, who seems to have lost valuable parts of his mind that must be found. Remember to look around the house to find extras, including the Alteration skill book The Lunar Lorkhan behind the overturned table at the head of the bed. There are a few health potions downstairs in an overturned cupboard labeled Heal Yourself. These may be useful later. In total, you will have to complete four tests. The tests of Perception and Patience are located on the upper floor, and the tests of Courage and Resolve are on the lower floor; you can take them in any order. When you complete a test, you will be transported back to Henantier. Look before you leap, as this room is filled with traps. Take the torch from the box and start walking the path, taking care not to walk on any suspicious looking tiles. Some have obvious trap triggers on them, while others look like they are crumbling and will cause you to fall into the Abyss. If you step on a pressure plate, stop immediately, as they will cause a rockslide directly in front of you. At the end of the path you will find Henantier's Perception. There are several obvious places to stand and catch your breath. You must defeat two minotaurs from Henantier's Dreamworld. A box provides you with several sets of leveled equipment: heavy armor, light armor, a blade weapon, a blunt weapon, and a lightning staff. 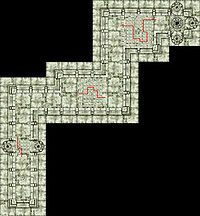 After you have defeated the minotaurs, a staircase will appear that will lead you to Henantier's Resolve. Using the lightning staff will allow you to take them down quickly without getting yourself hurt. 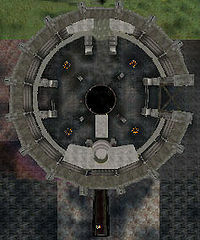 If your Acrobatics skill is high enough, it is possible to jump up on to one of the four tall columns in the center of the arena where you fight the minotaurs, and then jump up to the platform where the Element of Resolve is located, allowing you to bypass the fight with the minotaurs entirely. Here you must dive deep through an underwater tunnel and since you can get turned around because the swimming movements are not that precise, it is one of the more difficult tests. First get a weak potion of the sea from a chest before beginning the Test. Wade in as far as possible before diving in to minimize the time needed to swim halfway through the tunnel to reach the other Potion of the Sea found at the bottom of a shaft. Drink the potion and then head north (ignore the green compass arrow) to follow the tunnel to reach the wooden door of the Grotto of Courage at the end of the underwater passage. Henantier's Element of Courage is inside. Take the scroll from the box. It contains instructions on how you should walk on the tiles without setting off the traps. Look for a series of identical symbols that form a path from the bottom of the diagrams to the top, and follow that path on the tiles. Past all three sets of tiles, you will find Henantier's Patience. If you're impatient, jumping over a row or two of tiles is also possible, although hazardous due to the Dart Traps that fire when stepping on a wrong tile. After you have completed all four tests, speak with Henantier again, who seems to have regained his wits. He sees the truth in your words and you'll be transported back to the real world. Your inventory will be returned and all items from the Dreamworld are removed. Henantier gives you six scrolls as a reward. If you have installed the Spell Tomes official plug-in, any of the scrolls may be replaced by one, just as with usual scroll loot. This quest is not part of the Bravil Recommendation, although both quests come from Kud-Ei and can be acquired simultaneously. This can be confusing, as it is possible to accept both quests simultaneously. It is not recommended though, as it may result in errors, making finishing one of the quests impossible. It is preferable to finish the recommendation quest before attempting this one, or to finish this one before starting the other. Sleeping to enter the Dreamworld will not actually cause the level up. If you've committed a first murder since last sleeping, Lucien Lachance will appear when you first wake in Henantier's Dreamworld to begin the Dark Brotherhood questline. If you've been suspended from the Dark Brotherhood, when you first wake in Henantier's Dreamworld you will still be attacked by the Wrath of Sithis. The underlines show two hidden words in the text: "HERO" and "MEGAN S". Megan Sawyer worked as an environmental artist for Bethesda Softworks; she added her name into the puzzles as a spacer but forgot to remove it later. You can also pick her name out in the second puzzle, but the "E" was replaced with "M" when the path was inserted. The addition of "HERO" appears random. The dim background image on the Scroll is a picture of the Birthsign of the Mage. 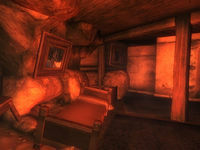 Most items are removed from your inventory when entering the dream world, but quest items are merely hidden from view. This means that if a quest item is assigned to a hotkey before entering the dream, it can be equipped as usual. If you attack Kud-Ei or attempt to steal before entering the dream world, Henantier will wake up, afterwards simply walking about. He can not be communicated with, and attempting to do so will trigger one of the same messages used when activated during his sleep. You may still go into the dream world and finish the quest. If you ask Kud-Ei about the Recommendation quest after starting to follow her, she will not give you the vital information once you get to Henantier's room, instead delivering her line about getting the staff. ? As of version 1.1.x, localized versions (e.g. French or German) of the game seem to have a bug where the scroll from the "Test of Patience" test is completely blank. 10 I've heard that Kud-Ei at the Mage's Guild in Bravil is searching for assistance in locating a missing friend. A reward is being offered, so I've decided to find out more information. 20 I've spoken to Kud-Ei of the Mage's Guild in Bravil. It seems that her friend, Henantier isn't missing after all, but trapped somewhere and Kud-Ei needs my help liberating him. Kud-Ei said to return to her when I'm ready and she'll take me to him. 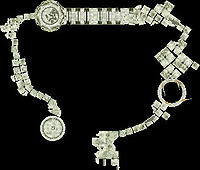 30 Kud-Ei has explained that Henantier has become the victim of his own creation, the Dreamworld Amulet. He's trapped inside his own dreams, and I'll need to put on the amulet and go to sleep to enter Henantier's dreams and hopefully retrieve him. When I'm ready to do this, I should speak to Kud-Ei, who will prepare me for the journey. 40 Kud-Ei has given me Henantier's Dreamworld Amulet. I need to enter his dream by going to sleep while wearing the amulet. Kud-Ei also warned me that if Henantier is slain in the Dreamworld while I'm there, I'd be killed as well, so I must be careful. 50 I've entered Henantier's Dreamworld. To my surprise, I've arrived naked except for the Dreamworld amulet! Not only am I unarmed, but also I've discovered that the amulet is preventing me from using any magic. I'll have to explore this strange place in hopes of finding something to defend myself with. 60 I've located Henantier. He seems awfully confused and doesn't understand where he is or how he got here. He did mention that he lost some things. Perhaps they're keys or clues explaining how to exit this bizarre place. I have no choice but to explore the recesses of his Dreamworld and find these objects. 80 After giving him the four Dreamworld Elements, I've succeeded in convincing Henantier he was in a dream, and we've returned to the real world. I should speak to him now that we're back. 100 1Yes Henantier has thanked me for saving him. As a reward, he's provided me with some of his magic scrolls. 200 1Yes One of the characters needed to complete this quest has died. * Since Henantier is essential, he can not be killed and this quest stage can not be obtained without use of the Console. It is possible to use the console to advance through the quest by entering setstage MS05 stage, where stage is the number of the stage you wish to complete. It is not possible to un-complete (i.e. go back) quest stages. See SetStage for more information. Esta página foi modificada pela última vez à(s) 03h00min de 14 de maio de 2015.